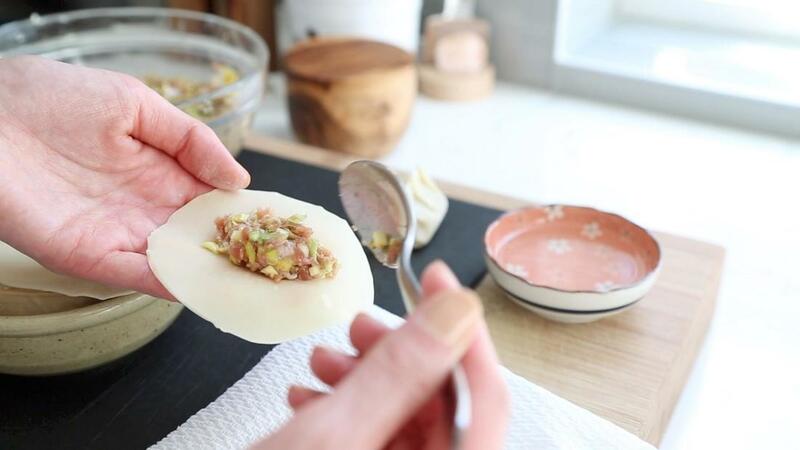 The BEST ♥ Pork & Leek Potsticker Recipe! 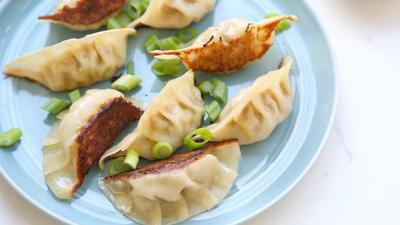 ﻿Pork & Leek Potstickers are so easy to make! 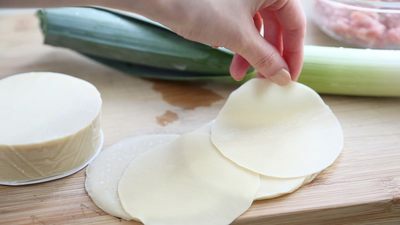 If you've never made potstickers before it's as simple as seasoning the filling, then wrapping as many as you want to eat. This is my favorite potsticker filling recipe because all the flavors just work and taste amazing! Here, I'm using organic leeks to mix in with the pork filling, taking care to chop the leeks into smaller pieces, but not to mince them. This way there's some texture to the potsticker, which I think makes them heartier and more gourmet. Also, if you like your potstickers EXTRA CRISPY, you can always brown them on 2 sides instead of just the bottoms. 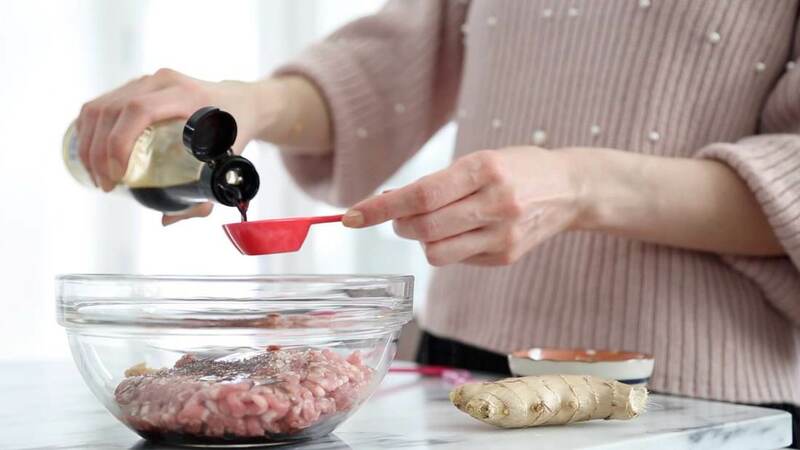 TIP: Double the recipe to make big batches and wrap extra potstickers to freeze later for a quick weeknight meal. If you have any leftover wrappers, to prevent them from going bad or drying out, immediately wrap them in a paper towel, then freeze in plastic bag for future use. Prep Time = 45 min. Prep your leeks by washing and chopping into small pieces. Prepare a medium sized bowl and add in the ground pork and other seasoning ingredients. 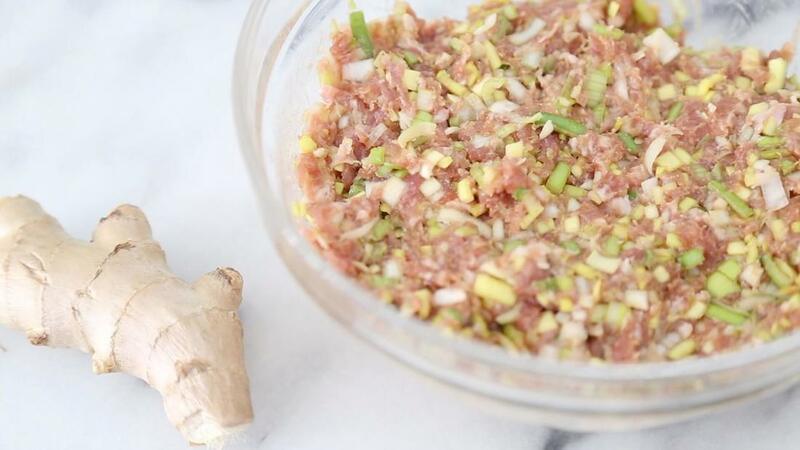 Using you bare hands or a spatula, mix the ingredients and the chopped leeks well. 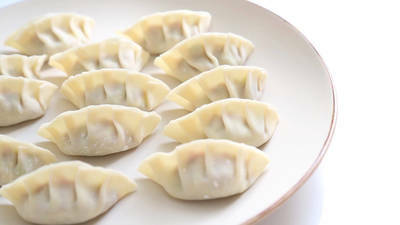 Prepare a small dish of water and your potsticker wrappers (note: I prefer the thinner wrappers, if available because I think it's more delicate tasting). Place 1 Tbsp. of the pork filling in the center of wrapper. Then fold over and pleat 5-6 times. Wrap until all of the filling is used up. Freeze the potstickers that you don't want to cook right away. In a non-stick pan over medium heat, add 1 Tbsp. of oil, then gently add your potstickers. If you don't want them to stick together, make sure they aren't touching during this step. Add in 2/3 cup of water, then cover with a steaming lid. Steam for 6 minutes or until almost all the water has evaporated, then continue cooking uncovered for another 2-3 minutes or until the bottoms of the potstickers are golden brown.